In July 2009, the Horsham Lions Club presented $750 scholarships to three seniors, and $1,500 to one senior from the Horsham area, totaling $3,000 in scholarships. Pictured above, left to right are: Jeffrey Smith from Lansdale Catholic High School, and Jessica Lloyd and Erica Sokoloski, both from Hatboro-Horsham High School. The club strives to present several scholarships to local students each year, in an effort to assist in furthering the education of community-minded young adults. The students were chosen anonymously, and the choice was made not only on academic merit, but on the level of community and humanitarian involvement the students have displayed. Since beginning the scholarship program, the Horsham Lions Club has presented more than $150,000 in scholarship money to local students. Mr. Smith received the sole $1,500 scholarship, which was named in memory of Max Hankin (deceased), longtime Horsham entrepreneur and participant in the Lions Club. He and his wife Janet Hankin (also deceased) have helped the Lions in innumerable ways over the years. Without their support and the support of their family, scholarships such as these would not be possible. Jeffrey Smith attended Lansdale Catholic High School. He’ll be going to Hofstra University this fall, studying theater. Jeff is a very proud Eagle Scout, the highest rank a Boy Scout can achieve. He’s been very active in his church youth group, and has lent his time to several charitable organizations. He’s received many honors for leadership and service. Jeff also organized a used-coat drive last winter. Erica Sokoloski attended Hatboro-Horsham High School, and will be going to Gwynedd Mercy College this fall. She hasn’t yet decided upon a major. She’s also been very active in Key Club in school, and has been an avid dancer since a very young age. Erica has volunteered for things like Relay for Life, a Diabetes walk, and also volunteers at a local retirement home. She has the unique distinction of having a perfect 4.0 grade point average. Our Horsham Day 2009 fundraiser was a tremendous success, we earned more money this year than in any year past. This is a pretty amazing statement, considering we sold out of roast pork by 6pm. Another HUGE THANKS goes out to Sam Braccia for graciously donating our roast pig for yet another year. Sam is one class act. This year we partnered with Tori's Gourmet Water Ice, who sold ice cream as well as water ice at Horsham Day. The people at Tori's were kind enough to donate a portion of their profits for the day to the Horsham Lions Club. This was IN ADDITION to a very generous sponsorship donation we received from Tori's. NORRISTOWN, Pa., — July 13, 2009 — Genuardi’s Market in Maple Glen recently donated more than 300 pairs of new eyeglasses to the Horsham Lions Club. In early 2009, when Genuardi’s purchased the former Glen Center Pharmacy, the eyeglasses were part of the pharmacy’s existing inventory. After the pharmacy relocated inside the Maple Glen store, Genuardi’s decided to donate the eyeglasses. The Lions Club is the world’s largest service club organization. Lions clubs perform numerous charitable deeds and are recognized worldwide for their service to the blind and visually impaired. Their commitment to sight is exemplified through the collection and recycling of new and used eyeglasses for distribution to the visually impaired. In addition to collecting eyeglasses, the Horsham Lions Club provides assistance to those in need requiring cataract surgery, awards scholarships to high school seniors, and provides holiday dinners for the needy. Andy Weiss, treasurer of the Horsham Lions Club said, “We would not be able to accomplish all that we do without the help of companies like Genuardi’s. We are so grateful to Genuardi’s for this generous donation so that we can help others see.” Andy said that the Horsham Lions Club has a membership of 32 and is eager to attract new members. For more information visit their web site at Horshamlions.com or contact Andy at 267-714-8884. For more than 85 years, Genuardi’s has been serving Delaware Valley consumers. Nearly 5,000 team members operate 37 stores throughout Pennsylvania and New Jersey, carrying on the company traditions of freshness, quality, great value and legendary customer service. Genuardi’s has been a division of Safeway Inc. since February 2001. Safeway Inc. is a Fortune 50 company and one of the largest food and drug retailers in North America, based on sales. The company operates 1,739 stores in the United States and western Canada and had annual sales of $44.1 billion in 2008. The company’s common stock is traded on the New York Stock Exchange under the symbol SWY. Safeway supports a broad range of charitable and community programs and in 2008 donated more than $248 million to important causes, such as cancer research, education and hunger relief. 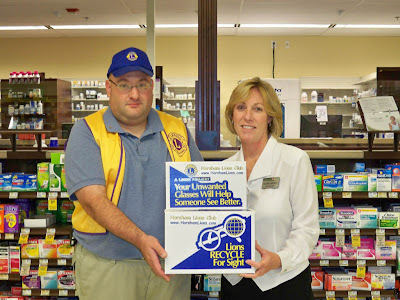 The Horsham Lions Club wishes to thank Dr. Mary OKoren at Willow Eye Care for agreeing to host one of our eyeglass collection boxes.